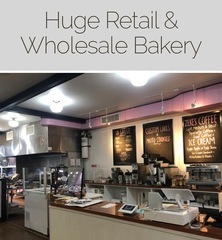 M21910 (2) level retail and wholesale bakery company has closed and will sell 100’s of items of high-end equipment, appliances, small wares, decorative, dining, Cae and coffee assets. AUCTION CLOSING DATE: Friday, December 7th at 1:07 pm Bidding closes on the first item at 1:07 pm, then closes at the rate discussed in these Terms and Conditions of Sale. When You Gotta Have It! Founded in 1989, JLR Auctions mission is to provide auction services and asset recovery to the estate and business communities. Transforming from a traditional outcry "live" auction to Internet only in 2011, JLR Auctions has combined the benefits of traditional liquidation techniques and the efficiency, affordability, and power of online auctions. Today, JLR Auctions is a market leader in Internet-only event-based auctions while honoring its legacy of innovation and continuing its heritage of high quality service. © Copyright 1999 - 2014 JLR AUCTIONS.